… all your clothes are made of leather – including your pyjamas. Have you taken a sudden liking to bodycon clothing that’s three sizes too small? Are you considering a sexier upgrade to your car or even your partner? 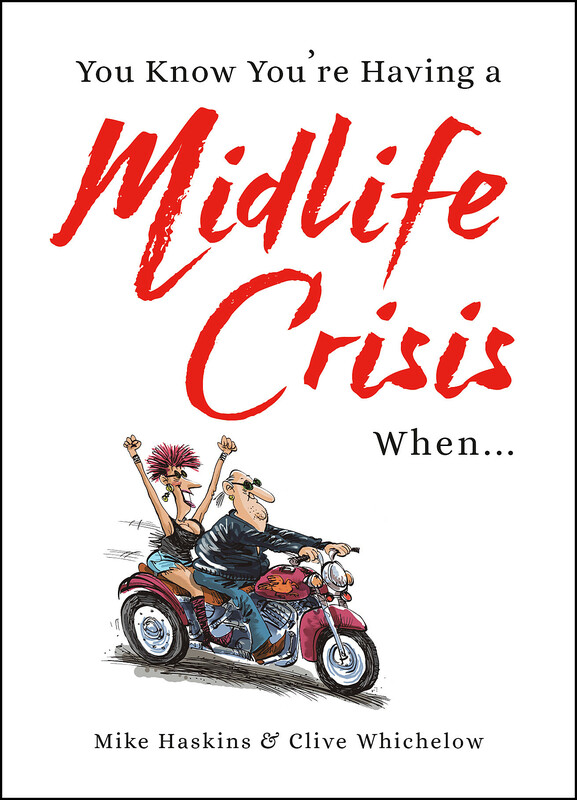 Try not to panic: it’s only a midlife crisis. And besides, attempting to recapture your youth can be a lot of fun! Who said there’s anything wrong with growing old disgracefully? Clive Whichelow is a journalist and comedy writer. He has written for Rory Bremner, Jonathan Ross, Spitting Image and many others as well as for The Mail on Sunday, the Daily Express and the Daily Mirror. Mike Haskins is a writer and researcher who has worked on TV providing scripts for everyone from Simon Pegg to Christopher Biggins. He has worked on radio series featuring Des O’Connor, Bruce Forsyth and Brian Eno (although sadly not all at the same time). He has worked for many years with Griff Rhys Jones and has written (or co-written) a vast pile of books including the bestselling joke collection Man Walks Into A Bar.